Updated Sunday January 25, 2015 by Andre Dumais. 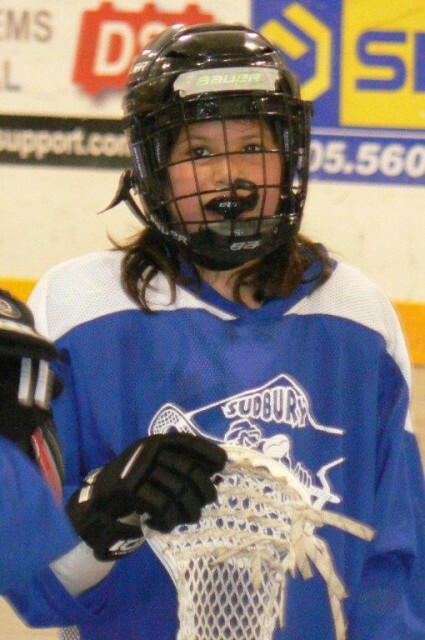 The Greater Sudbury Lacrosse Association (GSLA) began as a simple house league program in 2001. At the time there was very little “lacrosse culture” in Sudbury. In the beginning passing, catching and cradling was a challenge for most players and coaches at all levels and learning the game started with the very basics of the game. By 2004, the local program applied, and was accepted into the Ontario Lacrosse Association and the initial competitive (All-Star) teams played some competitive games outside Sudbury. Players also participated in the Ontario Lacrosse Festival where the provincial championships are played and received some recognition for the skill they exhibited after only three years of lacrosse. The GSLA also received numerous awards in recognition of the way the game was introduced to the community, skill development and steady growth of participants. The local lacrosse group has also been approached by many lacrosse associations/groups from across Ontario and Canada seeking advice/information about our approach to the game and developing lacrosse in the community. In 2010 we had grown to 560 members. The GSLA credits most of its success to making “grass roots” the number one priority and committing to some basic principles/philosophy that we believe are essential to minor sports in any community. The GSLA offers minor lacrosse for players 5 to 21 years of age. This is unlike many other sports where the “minor” league ends at the age of 17 or 18 years. Both house league and all-star (rep) teams are open to both male and female players. The participation of females has increased from year to year. Unlike many local sports organizations, the GSLA does not represent any of the former communities, neighbourhoods or segments in our amalgamated city. We strive to mix players from different parts of the community to make up our house league teams and participation of people from communities outside the municipal boundaries is encouraged. Regardless of residence all minor players wear the Rockhound logo. Everyone is a “Rockhound” regardless of the residence, age, or any other status. To encourage players to try our sport we have initiated a “free-stick” program where 100 first time players will receive a free stick. The model of stick chosen is above that of the typical “entry level”. Although costly, the GSLA continues to prove that with the proper equipment and instruction, beginners can quickly perform basic skills and with that success comes more confidence to continue the challenge. The free stick program also reduces the cost for families trying out lacrosse for the first time. We also offer discounted registrations for multiple players from a single family. The GSLA also promotes a practice of keeping families together travelling to zone or invitational tournaments. We promote ‘association vs association’ rather than having separated teams travel to different locations to play each other. This allows families with players in different age groups to stay together and still watch their children play in a higher level of competition. It reduces cost for families as overall travel is reduced. Other associations in the province that use this approach report that the experience is much more enjoyable than the traditional alternative. Keeping costs as low as possible for families is very important to our growth. It is important to us that everyone has an opportunity to play Canada’s National Summer Sport. We attempt to reflect the ideals of fairness, sportsmanship, respect and citizenship in our Constitution. Every member, which includes players, officials, coaches, parents and organizers, must adhere to a written code of conduct which is enforced by a discipline committee. This is done in an effort to keep the essence of sport at the forefront. The GSLA tries to promote a concept of “winning” that goes beyond the score sheet. Although players are encouraged to play the game within the rules and the object of the game is not compromised, success (“small wins”) can be found within all games. Coaches, parents and fans of the game should celebrate the demonstration of a new skill learned, self-esteem, confidence and sportsmanship. This is especially true at the younger ages. Since its beginnings, the GSLA has been committed to the idea of continued improvement of its organizers, members, coaches, officials, players and teams. One of the unique aspects of the GSLA is the emphasis on a strong house league program. That strength relies on instilling a love of the game and hunger for personal improvement. Part of keeping a house league strong is the idea that “All-star “players must also play house league. This is a departure (or return) from more popular ideas where the better players play in a more “elite” division. Players with more experience or ability are encouraged to ‘step up’ and take on leadership roles on their assigned house league team. These players are challenged to assist in practice, help others improve skills, and work on “playing the game without the ball”. This is done by working on using their skills to include others in the play, or allow/create opportunities for team mates and keep the team improvement over the season at the forefront. The Ontario Lacrosse Association has recognized the success of our strategy by awarding us with the Arthur Poitras Award for the promotion and development of lacrosse in the community. We have also received inquiries from the Canadian Lacrosse Association and other lacrosse associations regarding our approach to developing lacrosse in the community. From 2004-2009 the GSLA continued to receive annual awards recognizing the association and a number of awards to distinguish a number of individual members and their commitment/excellence in their sport. The Rockhounds now enter a rep team in all six different age groups at the Ontario Lacrosse Festival. This is an annual tournament where teams from across Ontario compete for a provincial championship. The Sudbury Rockhounds have won silver and gold medals and continue to improve their overall ratings over the past few years based on their performance. Fun is at the heart of this game. The slogan “Catch the Fun. Play Lacrosse” has been a popular phrase since our beginning. This ‘branding’ helps make fun part of the organization’s culture. Positive feedback and honesty are important characteristics that are encouraged in all coaches (and parents). Every game has its small successes and disappointments. But something positive can be learned from every game (including a loss on the scoreboard). The GSLA is entirely volunteer-based and is very reliant on community support. Financial sponsors from the community support the Rockhounds by donating funds towards our game. We are now entering our tenth year and have become the largest users of the local arenas during the summer months. Facilities that would normally sit empty are in use due to the introduction of lacrosse in the Greater City of Sudbury. Although lacrosse is recognized an excellent “cross-over” sport for hockey, the GSLA notes that a significant portion of its participants do not play competitive hockey or other organized sports. We attribute this to the game itself – it’s a great game and organized with community values in mind anyone can be a lifelong participant. The Rockhounds have also made themselves known outside of the community which helps to project a positive image of our city. International magazines such as Inside Lacrosse (50 states and 8 other countries) ran an article on our local game; other lacrosse associations inside and outside Ontario have used some of the GSLA principles and rule alterations that allow for further skill development with lacrosse. The sport has made a financial impact on the community. Sports stores now carry lacrosse equipment and the expansion of our tournament has an impact on the local economy with accommodation and other service businesses. There is a growing curiosity about the game and our numbers continue to grow. People are interested in the game and high school students are asking that field lacrosse be brought into the high schools. If the game instils positive values and helps the person develop traits such as decision-making, healthy lifestyle choices, and respect for others it will “build” a better person. If the game is fun and is remembered fondly it is likely that a young player will develop into a coach or be part of the group that organizes the sport in the community.